The two wash stands were manufactured in the same year (1904). 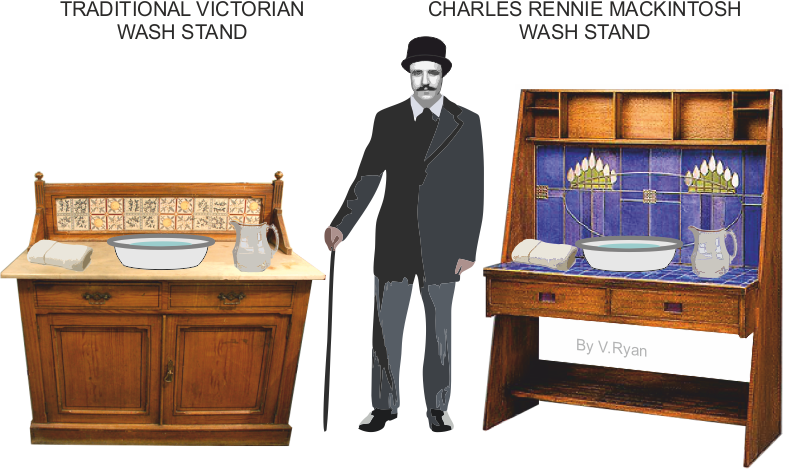 The Mackintosh wash stand was regarded as unusual, different and modern. Compare both wash stands using the criteria below. This wash stand has some interesting traditional features, such as the panelled doors and brass handles. It also a marble top, typical of Victorian times TRADITIONAL OR MODERN? This wash basin has some modern features (for 1904). It is quite plain, which is a modernist design characteristic. The tiles were a modern feature, especially as they fit together showing a floral pattern. The shape and form of the natural wood is minimalist. Pine has been used to manufacture this wash stand. The floral tiles have been used to waterproof the main surfaces. The lead beading is a bold feature, similar to the way lead beading was used a century ago with window glass. A Modernist piece of furniture (1890-1940), with some typical characteristics. The use of shelves, rather than a cupboard with doors and the angled sides reflects modernism. However, the use of floral tiles still suggests a touch of Art Nouveau (1980s).